Anthony Martial starred as Manchester United overcame a late scare to edge Everton 2-1 at Old Trafford and give Jose Mourinho a much-needed second win in eight matches. 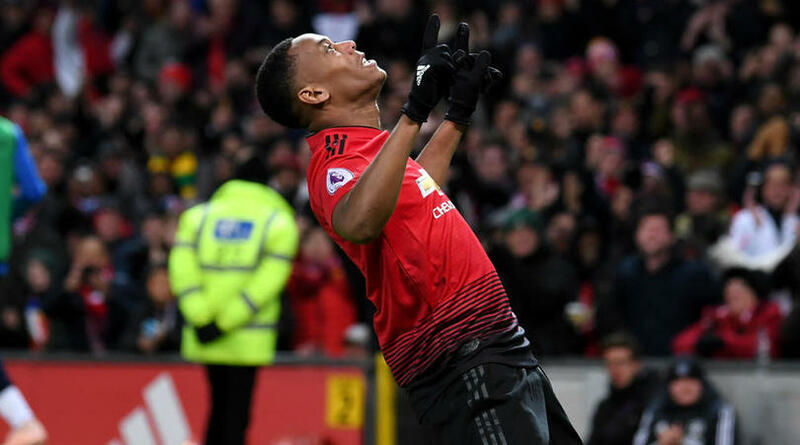 Having reportedly rejected United’s initial offer of a new contract, Martial ensured the week ended with the focus firmly on his talents as he created United’s first and scored the second in a scintillating display. Romelu Lukaku’s omission from the starting XI afforded Martial a prominent role and it was his quick feet that drew the penalty from Idrissa Gueye, who did get a toe to the ball before the attacker’s theatrical fall. Jordan Pickford impressively kept out Pogba’s initial effort, but the midfielder’s stuttering run-up was spared from more scrutiny as he rolled in a fortunate rebound. It was a role reversal for United’s second as Martial gloriously curled a Pogba pass into the bottom-right corner within four minutes of the restart. Bernard passed up a chance to drag Everton back into it before Smalling’s tackle enabled Sigurdsson to grab a consolation from the spot in the 77th minute. His penalty-taking method must rankle with pragmatist Mourinho and a loose pass led to the Toffees’ goal, but Pogba was so often at the heart of United’s best moves and in this mood his manager will accept the good with the bad. Muted for much of the hour he was on the pitch, Bernard’s failure to make the most of a golden opportunity soon after Martial’s strike denied Everton greater hope of snatching a point.